The Design is clean with a carbon fiber door and front panel, be it a think veneer on the clone on the front panel and maybe not the same quality carbon door. The squonk hole is a nice size, but has slightly sharp edges that won’t cut or scratch but need to be noted. The door press fits and also has magnets to help keep it in place. The overall weight and size are light and super small, it fits great in the hand. The authentic is made of delrin and is sure to be more durable than the hard plastic of the clone. The fit and finish is decent, not incredible but let’s remember we are talking about a $35 mod. At this price this makes for an amazing deal. The overall aesthetic is sort of evil and rather dope looking really, black on black. 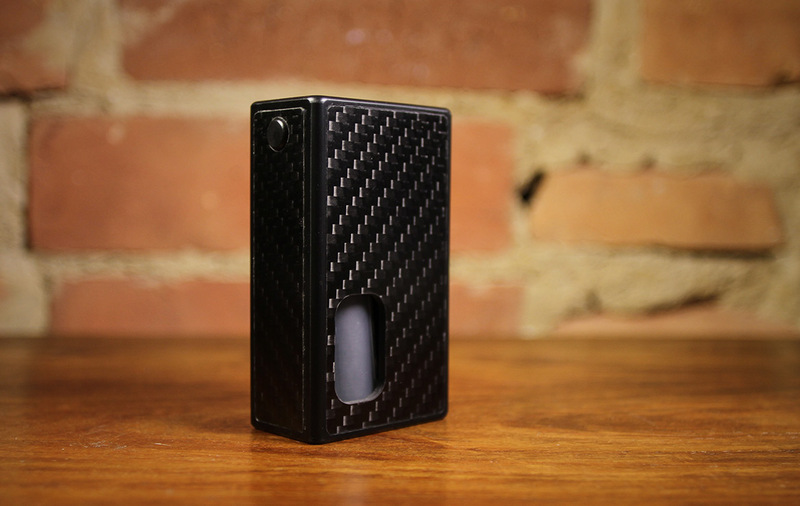 Throw on a black atty and you have a murdered out little package. Inside is clean as well, the battery sits positive up and is easy to get in and out of the mod. There is a bit of an indent under the button that houses the mosfet for the button so be careful on which bottles you use as they need to clear this indent. We included links before for a great replacement option. The included bottles are super cheap and rather stiff plastic, replacing them with a black soft silicone bottle adds to the look and vastly improves the squonking action. The 510 is a direct clone of the SVA style, it is adjustable with a screwdriver and has smooth threads. With the popularity and return of squonking we have gotten spoiled with the 510 threaded refill bottles that make squonk life way easier and less messy (included links below to grab some too) and we wish the 510 was spring loaded. Occasionally on refill it will move your 510 adjustment and need to be re-adjusted after refill, so carry a screwdriver for this one. Voltage drop seems to be minimal and battery life is what you make it with you build and number of coils. But like most mechanical squonkers 1-2 batteries should get you through the day. SVA is one of the greats in the squonking game and sure we wish we could get our hands on only originals for review but it’s just not a reality. But at $35 for this rather good 1:1 clone it makes it hard to not at least give it a go. We haven’t been as active as of late and there is one reason, squonking. Find yourself a decent squonk mod a good BF (bottom feed) enabled RDA and you can find flavour nirvana pretty quickly. Chasing the latest tech or tank is fun, but for a great vape it’s as simple as a mech squonker and an RDA. We will continue but we will report only those juices, attys, and mods that really have something to offer, the game changers. And this PuntoZero clone is a great squonker with a nice clicky button (thanks to the mosfet) in a light weight tiny package for a great price. Try the clone, if you love it, buy the authentic (or at least try to).